Third Congressional District candidate Benny Shendo Jr. is getting a lot of support — and campaign contributions — from Indian pueblos and American Indian officials. That’s not surprising. 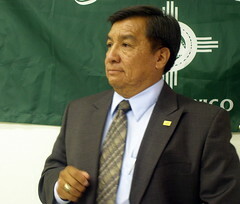 Shendo was born and raised in Jemez Pueblo and until late last year served as Gov. Bill Richardson’s secretary of Indian affairs. If elected, he’d be New Mexico’s first Indian congressman. But he’s not the only candidate in that crowded Democratic primary who’s getting financial support from American Indians. Ben Ray Luján collected some Indian money also, according to federal campaign finance reports filed this week. Shendo, who reported $113,626 in contributions during the three-month quarter ending March 31, got money from tribal governments, including $6,900 each from Jemez and Isleta pueblos; $2,300 from Acoma Pueblo and $250 from Tesuque Pueblo. He’s also received money from a couple of out-of-state tribes: the Ute Mountain Utes in Colorado and the San Manuel Band of Mission Indians in California, each of which gave $2,300. And there are individuals who work with Indian governments, agencies and other institutions. Eddie Gomez, executive director of Isleta Pueblo, gave $4,600, and his wife, Theresa Gomez, who is deputy secretary of the state Indian Affairs Department, gave another $2,300; Richard Williams of Broomfield, Colo., executive director of the American Indian College Fund, gave Shendo two contributions totaling $2,685; Kai Gachupin, president of The Hemi Group, which provides jobs to American Indians living on and near Jemez Pueblo, gave $2,300; Joel Matthew Frank, an ambassador with the Seminole Tribe in Florida, gave $500; Herman Agoyo, realty officer for Ohkay Owingeh, gave a total of $500; and Sarah J. Yepa of Albuquerque, a manager with the federal Office of the Special Trustee for American Indians, contributed $250. And some guy named Benny Shendo, who is running for Congress, pitched in $10,000 to the campaign. Luján, collected a total of $328,740 during the last quarter. He didn’t get as much from American Indians as Shendo did, and what he did get represented a smaller percentage of his total than was Shendo’s. But it wasn’t chump change either. Ohkay Owingeh gave Luján $2,300 as did the Jicarilla Apache Nation, while Zia Pueblo gave $1,000. Among individual contributors, Gov. Robert Benevidez of Isleta Pueblo gave $2,300; Dwayne Virgint, chief operating officer of the Indian Pueblo Cultural Center in Albuquerque, contributed $1,000; and Richard Jaramillo, principal of Santa Fe Indian School, donated $1,000. Hitting up the lawmakers: Luján scored well in getting contributions from people who say the phrase “Yes sir, Mr. Speaker” far more than the average person. I’m talking, of course about Democratic lawmakers in the state House of Representatives, who answer to Luján’s dad, House Speaker Ben Luján of Nambé. 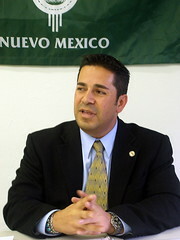 Among the representatives contributing to the younger Luján’s campaign were Joni Gutierrez of Mesilla and George Hanosh of Gallup (each $1,000); Al Park, Dan Silva and Henry Kiki Saavedra of Albuquerque (each $500); Jim Trujillo of Santa Fe ($500); and Ed Sandoval of Albuquerque ($200). Also, Brian Egolf Jr., who faces no primary or general election opponent in his campaign to become the next representative for Santa Fe’s House District 47, contributed a total of $2,300 to Luján’s campaign. The speaker kicked in $1,000 to his son’s campaign. The younger Luján did even better among those who lobby in the state Legislature. Ed Mahr, Robert Rivera, Ricardo Barros, Bob Barberous, Dan Weaks ($2,300 each); Tom Horan ($1,300); former House Speaker Raymond Sanchez, former Senate President Pro Tem Richard Romero and Maurice Bonal ($1,000 each ); Carroll Cagle, Natasha Ning and Fred O’Cheskey ($500 each). The “Bitter Battle”: U.S. Rep. Tom Udall has a free ride through the Democratic U.S. Senate primary in New Mexico. But the national Republicans on Wednesday launched an attack against him — and six other Democratic Senate candidates — and are taking a shot at presidential hopeful Barack Obama in the process. No, it’s not a TV attack ad. Those things cost money. We’ll be seeing plenty of those by general election season. It’s what the National Republican Senatorial Committee calls a “video press release,” an e-mail that links to near identical ads on YouTube. The ad shows Obama talking while playing the now infamous comment that people in small towns “get bitter; they cling to guns or religion or antipathy to people who aren’t like them or anti-immigrant sentiment or anti-trade sentiment as a way to explain their frustrations,” which Obama made at a private fundraiser in (gasp!) San Francisco. The video portion isn’t quite in synch with the audio, like those old Japanese monster movies overdubbed in English. “Will he cast his vote for Barack Obama?” a superimposed text asks as pensive piano music begins to swell, “a man who calls small-town America bitter?” You can see the video HERE. Udall, who indeed is a superdelegate, has been uncommitted. His campaign had no immediate response. That’s wrong. Overriding a veto takes a two-thirds majority, which would be 67 senators. Sixty is the magic number to invoke cloture, which is used to break the filibusters that block legislation from reaching a vote in the Senate. I’m sure I had a good excuse for missing class the day I was supposed to have learned that.